Aimee Semple McPherson is a fascinating character in American history and an early pioneer in radio evangelism. 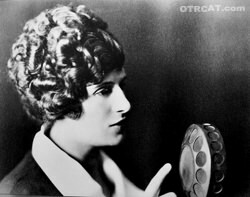 She was more than just a radio minister; she was a movement in 1920s America with millions of followers. In 1926, her presumed drowning at Venice Beach, feigned kidnapping, and the court case that followed was sensation in the media. 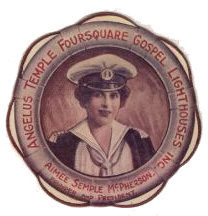 Aimee Semple McPherson's mother, Minnie Kennedy, worked with the Salvation Army and was a big influence on young Aimee's religious upbringing. Even while in high school, Sister Aimee was a crusader against teaching evolution in public schools. Soon after the birth of her second child she got the call to serve God when she heard a voice say "Will you go?" In 1915 Aimee began traveling around the United States having tent revivals with some crowds reaching well over 30,000 people. Aimee dabbled in speaking in tongues and faith healing during this time as was common at tent revivals. 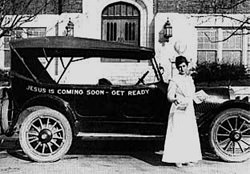 She traveled the country in her Gospel Car with the painted sign "Jesus is coming soon – get ready." A vivacious and spirited speaker, her tent revivals would last weeks in any given city across the country. She used a brass band, choirs, and props of all sorts in her sermons. 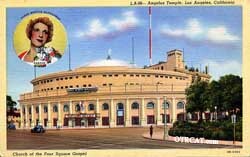 In 1923, Aimee Semple McPherson opened the Angelus Temple in Los Angeles, CA for the church that she founded, the International Church of the Foursquare Gospel. The church had a 5,300 seating capacity and was filled three times a day seven days a week. Hoping to reach even more people with her message, Aimee Semple McPherson begin a radio ministry from the church. Sister Aimee was the first woman to be granted a broadcast license from the Federal Radio Commission. 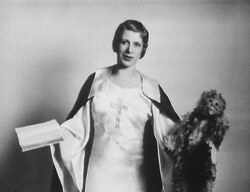 In May 1926, Aimee Semple McPherson went missing while swimming at Venice Beach, CA and was presumed dead with services being held in her honor. More than a month later, she was found dehydrated and wondering the desert in Mexico. Evidence later pointed to a rendezvous in Carmel-by-the-sea with a married boyfriend. Sister Aimee was charged by a grand jury for manufacturing evidence and falsifying police reports. She gave a dramatic demonstration of her kidnapping and escape for the grand jury and also spoke about the case on her radio program. The case was dropped, but the scandal tarnished her image. During the Great Depression, Aimee Semple McPherson open her church 24 hours a day to feed the hungry regardless of their race, creed, or color following the church's long standing tradition of integration. During WWII, she helped to sell war bonds vastly improving her public image. She died in 1944 after a sermon in Oakland, CA after an accidental overdose of sleeping pills. Aimee's daughter, Roberta Semple Salter, was also in the radio business and was a researcher for Hobby Lobby. Also known as Aunt Birdie, Roberta also helped developed popular radio music quiz show Name That Tune. This collection contains 14 rare sermons by Aimee Semple McPherson as well as a collection of wonderful photos and images of the era. See also the article Aimee Semple McPherson: Radio Religion and Reality by Anthony Rudel. See also: Dr John Brinkley Collection. 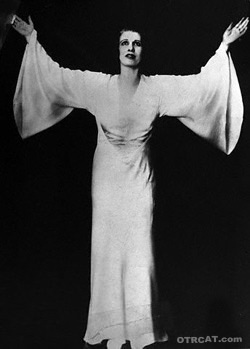 Be the first to comment on "Aimee Semple McPherson"